Our DIG IT days might be just the thing you are looking for. DIG IT is a unique driver experience day from Rocks By Rail. 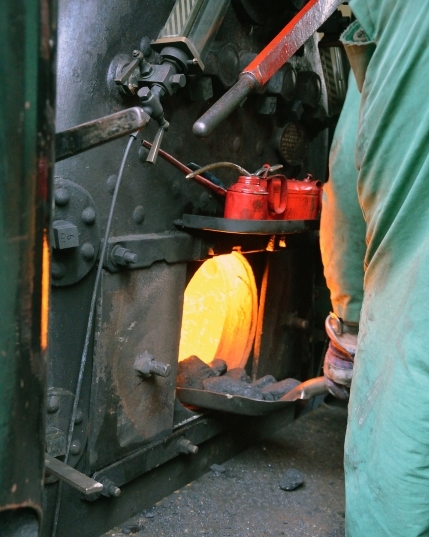 It gives you the chance to participate in several roles which were key to running the ironstone railways which were once common in the East Midlands, and helped builed modern Britain. DIG IT. 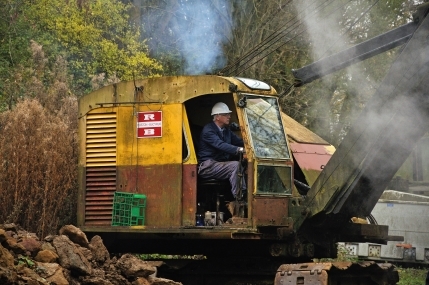 Take to the controls of a vintage Ruston Bucyrus 22RB diesel face shovel to simulate digging the ore from the quarry face and loading it into the iron ore wagons in the train. 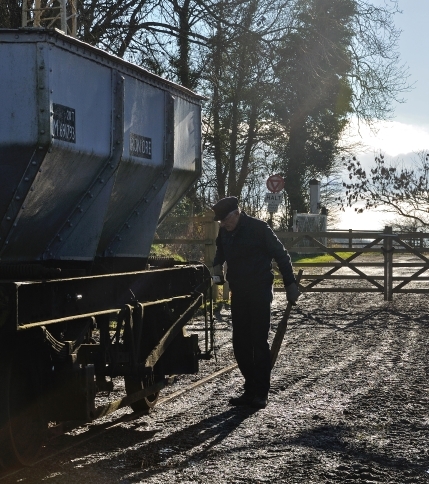 This will be very different from anything you have driven before, with a cab full of levers, it really isn’t the easiest machine to operate – but you will be under the watchful eye of one of our volunteers to guide you through loading the train. SHUNT IT. There are three tools in the quarry shunters trade – hand signals, a shunting pole, and a brake stick. The shunter must use these three things to efficiently guide the train into the quarry, apply the brakes, and couple and uncouple the wagons in sequence to get the precious ore loaded into the train , and get it moving as quickly as possible. FIRE IT. Its a dirty job… The Fireman is responsible for managing the boiler of the locomotive, feeding the fire with coal, the boiler with water, and making sure there is enough steam available to carry out the work that needs to be done. The Fireman also acts as ‘lookout’ where the Driver can’t see. DRIVE IT. An engine is nothing without a driver. You will take to the controls of an historic to propel the wagons up to the quarry and shunt them following the directions from the Quarry Shunter. The Driver is in charge of the train, so keep your wits about you! Each DIG IT day will involve four participants, so if you book a place just for yourself, you will be given a place in a group with three other individuals to make a group of four. The day will start at 9am with a cup of tea, introductions, and the all important safety briefing. In the morning, each participant will experience two of the four roles covered by the DIG IT package. Operations will stop for lunch, which is included, in the Sundew Cafe. Operations continue in the afternoon, when each participant gets to experience two further roles. Operations will stop at 4pm. A one year membership of the museum is included, allowing you to volunteer with us if you wish. Participants must be 16 years of age or over. Participants should be reasonably fit and able to enter the cabs of the engines unassisted – if you can manage to take two stairs at a time, you should be fine. We strongly recommend you wear steel toe capped boots or shoes, but good stout footwear is a minimum. We also recommend overalls, old clothes, or other workwear. The current price for the DIG IT package is £200 per person. However, if you become an active volunteer, you could be learning all of these skills for FREE! To contact us about arranging a DIG IT experience, please call 07873 721941, email us at curator@rocks-by-rail.org, or write to us at Rocks By Rail, Ashwell Road, Cottesmore, Oakham, Rutland, LE15 7FF. DIG IT is offered subject to availability. Every effort will be made to ensure all booked events go ahead. In the event that availability or conditions force a cancellation, we will seek to find an alternative date in the shortest possible time. Please inform the museum of any special requirements you may have as early as possible.